Although he was not yet finished with the Legislative buildings, Rattenbury won the competition to build the first new premises in Victoria for the Bank of Montreal. The site was once occupied by the home of Thomas Harris, Victoria’s first mayor. The bank was the architect’s first work in the Chateau style, a blend of Renaissance English and French architecture, that he would use to advantage in the later Empress Hotel. The walls were sheathed in Nelson Island ashlars of granite and Haddington Island stone. The interior featured intricate plaster and fine woodwork. Located at the termination of View Street, it was a landmark then and remains one today. When the bank moved its headquarters to Douglas Street in 1925, this became an office for the B. C. Bond Corporation (H. E. Boorman, manager). In 1931, the premises were renovated and enlarged to serve as a branch of the Bank of Montreal to relieve the stress on the Douglas and Yates Street branch. 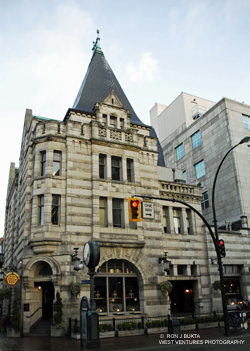 After use as a clothing store, the building was converted to the Irish Times Pub in 2004. At that time, the plaster work was restored, wood finishes were renewed and period lighting installed. This use continues today.